Glittering lights, colorful rooftops, azure swimming pools and the curving palms of Beverly Hills–you get quite the view from way up high in West Hollywood. We got the ultimate panoramic moments, for day or night enjoyment. Icelandic designer Gulla Jónsdóttir takes a holistic, poetic approach to space and structure. La Peer opened as the city’s first Design District hotel, with striking lighting installations, exquisite furnishings, and nearly 10,000 square feet of indoor and outdoor dining. Our favorite moments are always found sky-high, whether it’s waking up early for outdoor yoga or staying up late for killer parties under the clouds. The airy space combines natural, desert plants and California-chic lounge furniture to create a Moroccan appeal. One of the greenest places in Los Angeles just might be this hotel’s rooftop pool deck. The rows of chaise chairs are flanked by carefully designed landscaping. Palm trees reach up out of planters. Hedges line the glass barrier that separate you from the lush properties of the West Hollywood hills. Andaz West Hollywood is also a frequent home-away-from-home for those who find food fascinating, thanks to menus that rotate on a constant basis and the team surrounding Executive Chef Justin Taylor. Many of Restoration Hardware’s visitors come for the views as much as for the shopping. The RH: West Hollywood: The Gallery at Melrose Avenue is a 40,000-square-foot, Italian-Villa-inspired space. Nearly 10,000 square feet of that is an outdoor, rooftop pavilion, where the company invites you to grab an afternoon coffee and lounge on their incredibly comfortable outdoor furnishings. The views of West Hollywood stretch out all around you. West Hollywood Design District Garden Tour with Louise Roe at RH The Gallery on Melrose Avenue. September 24, 2015. West Hollywood, CA. Want to see the Hollywood sign sans the hike? Choose a clear day and head to the London‘s rooftop space. Don’t forget to pack your swimsuit, because they’ve got a great pool too––provided you’ve gotten a room downstairs. 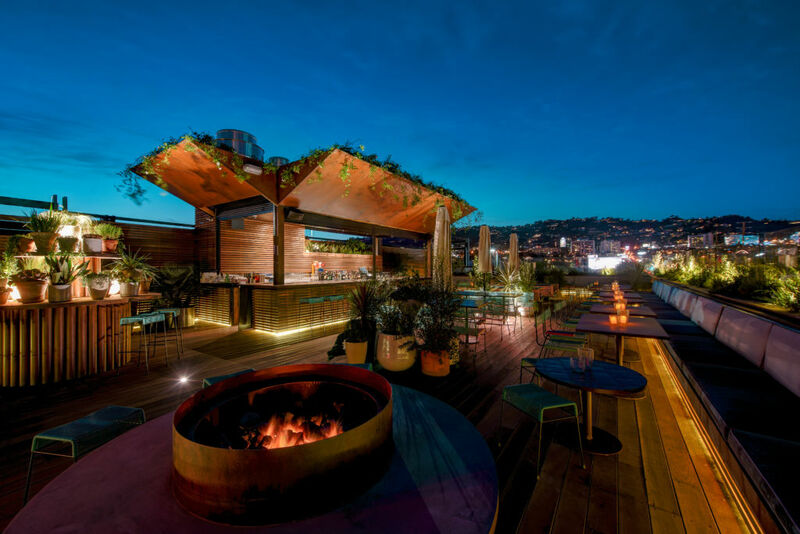 You can peer over the edge to take in the mayhem of the bustling Sunset Strip, lounge by the fire pit at night, throw a party on their Rooftop West event space or gaze outward to the homes of Beverly Hills. This view is truly 360 degrees. There’s a Polynesian vibe at L.P.––the open-air top of this multi-level drinking and dining venue. There are a lot of Asian flavors playing in the cocktails and on small plates. The warm night air surrounds you, as do flowering plants, vines, and a scattering of various succulents. The wooden plank floors, fire pit and teak wood bars give it a beautiful, natural warmth. You haven’t even gotten to the libation yet, which are some of the best in the city. This bar hangs its hat on boutique spirits, cutting edge drink design and gorgeous glassware. This place lands on a lot of “Best Of” lists with good reason, whether it’s the ultimate Mother’s Day outing or the perfect spot for a third date. We also feel it deserves a callout as one of the nicest venues for city views. The design includes a rooftop space both covered and open, depending on where you get a table. From living trees growing inside the space, to chandeliers dripping in greenery outdoors, the design is truly remarkable. Grab a few friends, order a bottle of crisp, cold rosé and the daily ceviche plus a toro tartare and spend a few hours enjoying what Los Angeles is, perhaps, most known for––year-round enjoyable weather.